?What kinds of campaigns can I use? The Top Practices Digital Book Marketing Campaign for Mastermind members combines our original Book Marketing Programs with the most current digital marketing thinking. Your ability to make great and compelling offers is one of the most effective strategies you have for bringing in patients that have expressed interest in your practice or your services. It’s a way for you to provide valuable information and then maintain communication with people who might otherwise forget about you in their busy lives. Our Top Practices books campaigns use a slow-drip process to follow potential patients through their initial interest to the point when they decide to make an appointment. It all starts with a compelling message that grabs their attention which is used for social media advertising, emails, websites, videos and much more. 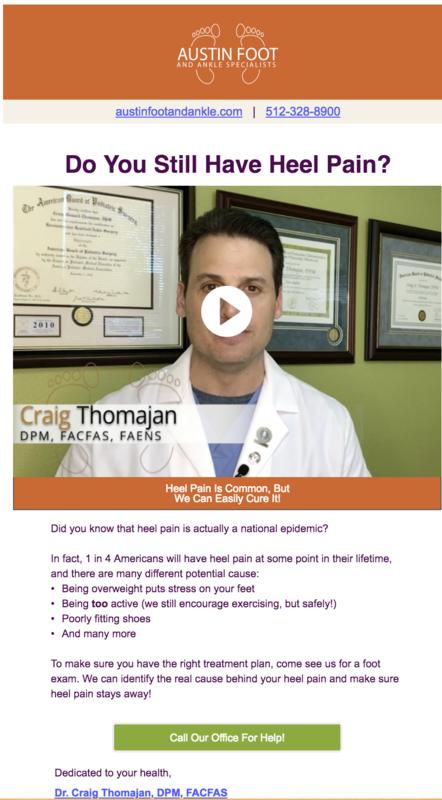 The “secret sauce” in our new 100% digital marketing program is that these ads and messages direct your prospective patients to take a quiz to learn more about their condition. 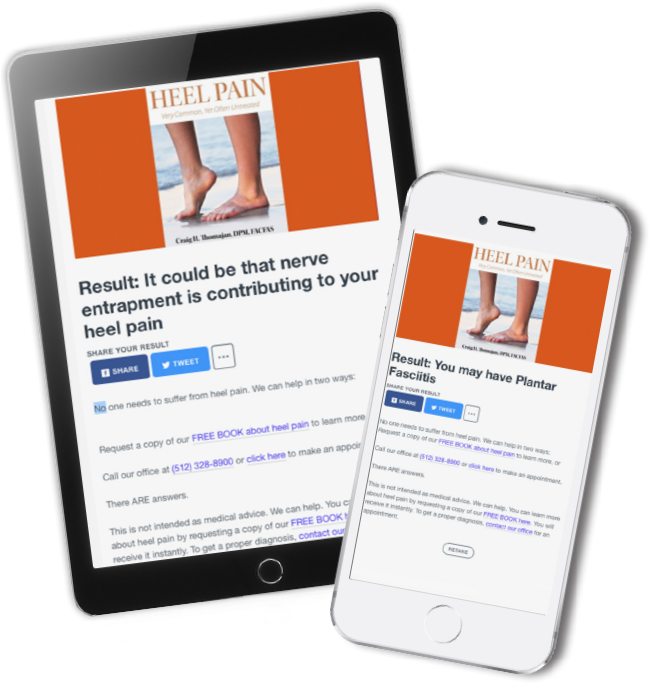 The addition of quizzes that help prospective patients easily engage with you to find out more about their heel pain is a key to moving them through the process. Quizzes are fun, quick, easy, and significantly increase engagement and interest. The results truly are explosive. The quizzes etiology is accurate and depending on how the patient answers the questions, they get a result that is consistent with their answers. 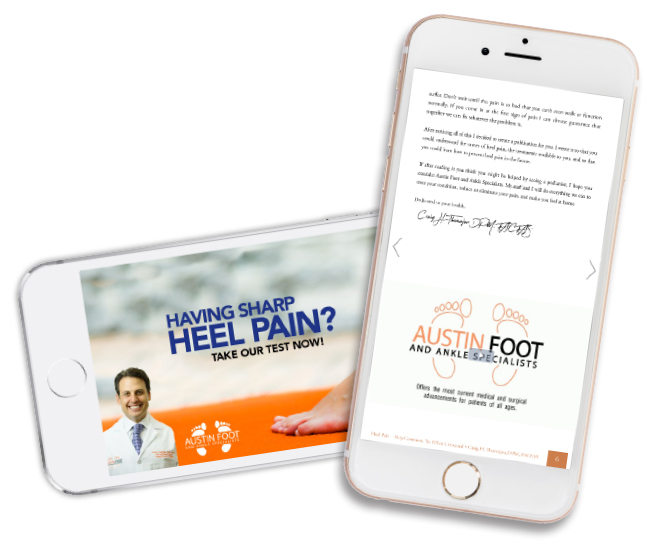 The patient then can easily call your office to make an appointment or request a copy of your free book on heel pain which is instantly delivered to them via email. If they request the book instead of calling immediately they are placed in a 7-step email conversion campaign designed to help them make that phone call and become a heel pain patient in your practice. That’s it! And the results are explosive. Patients and potential patients are rarely ready to make an appointment to handle their painful problems at the moment they first start looking for answers. They don’t want to have to commit at that time. However, in a few months, as their discomfort grows and they can’t put off getting help anymore, they will be ready. This unique book campaign combined with quizzes and ads enables you to be there through the decision-making process and be the doctor they think of when they are finally ready to take that step. Take your heel pain numbers to new heights. The results are explosive. The New Digital Book Marketing Program is for heel pain. Watch for new titles to be added.